For all the different things I make on this blog, I do still love a roasted potato as often as I can. Usually fluffy varieties are the ones, but a new potato can be a great alternative if treated right. Although to be honest slathering anything in rosemary, garlic and thyme is often a good idea. Really though, I made these as a vehicle for ranch dressing. When relatives come back from the States they bring food gifts like sweets, and the occasional sachet of Hidden Valley Ranch dressing. It’s MSG-tastic but when made up with mayo and milk makes a creamy, thick and delicious dip that goes well with crudites, salad potatoes, crisps, salad, chicken, green veg… it’s really good stuff. Preheat the oven to 220°C. Heat a large lidded casserole on a hob and add a little oil and a knob of butter. Add the herbs and garlic, fry for 30 seconds and then add the potatoes. Turn several times in the flavoured oil to get them started, then cover and transfer to the oven. Roast for 35 – 45 minutes, turning occasionally until browned and fudgy in the middle. Serve with ranch dressing . This entry was posted in food, garlic, potatoes, rosemary, thyme on August 31, 2013 by Gary. It’s been something of a duck week. I nearly picked up two duck breasts at the weekend, but when they cost £7 and a whole duck cost £8, it seemed a false economy (as buying meat portions almost always is). So after enjoying some lovely roasted duck breasts with red wine sauce and sauté potatoes, what to do with the rest of the duck? Heston had a bloomin’ good suggestion in Heston at Home : potted duck. Being a Heston recipe, it has quite a few stages of curing and confiting, and I got bored waiting for it so tossed aside the smoking stage at the end. I can’t say I miss it; there’s mountains of flavours rolling along in waves as you munch down through rich, soft meat. 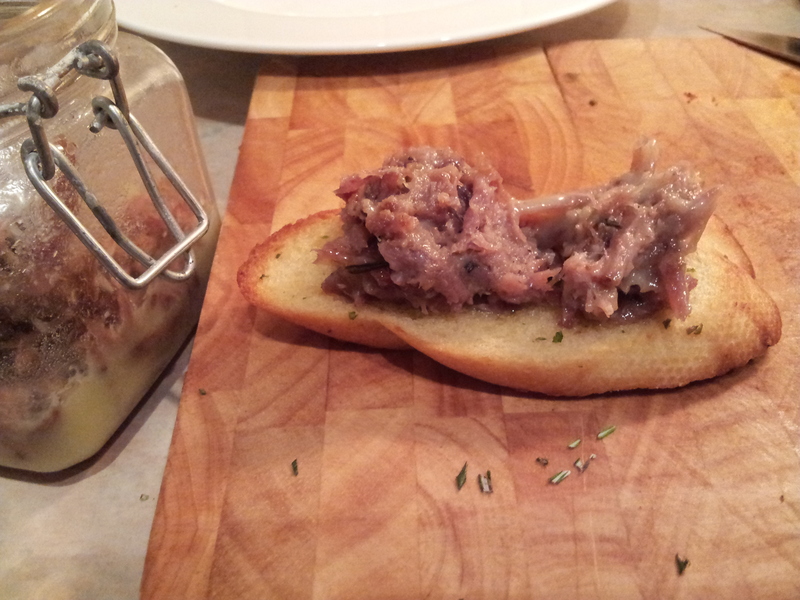 If you have some duck legs knocking about – and let’s face it, who hasn’t… – you could do much worse than piling this into a nearby kilner jar. So here’s what I did based on Heston’s recipe, smoking stage removed and all. Preheat the oven to 180°C. Put the star anise, cinnamon, peppercorns and bay leaves on a baking tray and roast for 5 minutes. Tip the lot into a pestle and mortar with the salt and orange and pound to dust. Rub all over the duck legs, store in a sealed container and refrigerate overnight. The next day, put your slow cooker on low. Add the duck fat, rosemary and garlic and allow to melt. Thoroughly rinse the duck legs and pat dry. Add to the slow cooker and top up with oil if required to cover the legs. Slow cook for 18 hours. Remove the duck legs from the fat and shred with two forks. Pack into a ramekin or kilner jar, and pour over a little of the cooking fat (save the rest for roast potatoes or pork belly). Refrigerate for a couple of hours then serve with your best toast, pickles and chutney (I used a fig chutney like this). This entry was posted in duck, food, orange, rosemary, salt, star anise and tagged heston blumenthal on February 8, 2013 by Gary. I was coming home on the train and decided it would be pie or nothing for dinner. Luckily all the ingredients were on hand. Patchwork for two reasons: I had some squares of puff pastry to use because I’d absent-mindedly cut loads more than I need when making sausage rolls; and ended up using a hodge-podge of all odds and ends things I like. Get your oven on to 180°C, and two frying pans over high heat with a dash of olive oil in each. In one of the pans get the mince in and stir often until browned and starting to crisp up. In the other pan fry the mushrooms and rosemary together. After 5 mins add the garlic. When the mince has browned add the red wine to deglaze the pan a bit, then add the stock, chestnuts and the contents of the mushroom pan. Mix the cornflour with a splash of water to make a paste, then stir this in thoroughly. Bubble away for a couple more minutes until thickened, then pour into a baking dish. Layer the squares as neatly as you like over the filling. Mix the mustard into the egg and brush over the pastry. Sprinkle with some coarse sea salt and bake for 30 minutes until golden and puffy (well, it is puff pastry after all). Serve with carrots braised in butter and dusted with nutmeg. 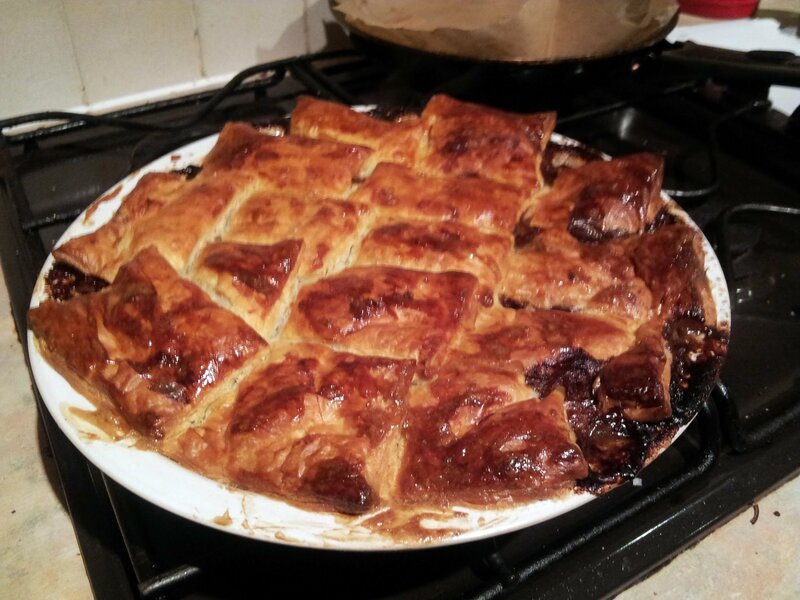 This entry was posted in beef, food, mushroom, mustard, pie, rosemary on December 18, 2012 by Gary. This is a cracking bread recipe, perfect with dips and spreads. One of those that can be tweaked according to what you’re in the mood for. I’ve also used it as pizza base and it’s great there too. Chop the leaves from one sprig of rosemary. Mix these with the dry ingredients together in a large bowl, then gradually add the water until you have soft, sticky dough. Knead for 5 – 10 mins until smooth and elastic. Cover with the olive oil, then cover the bowl with cling film. Leave in a warm place for an hour until it doubles in size. Heat the oven to it’s highest setting. Get the dough out, punch it down and spread into a large loaf on a baking tray dusted with flour. Top with the shallot rings, sprig of rosemary and a few grains of sea salt. Cover with a tea towel and leave to prove for 10-15 mins while the oven warms up. Bake for 25 – 30 mins, or until the bottom sounds hollow when tapped. Allow to cool before eating. 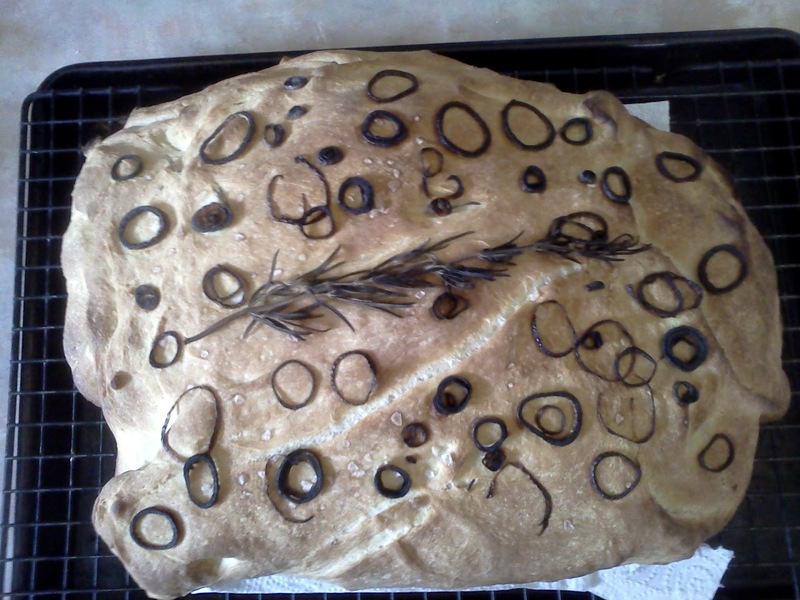 This entry was posted in bread, food, rosemary, shallot on July 22, 2012 by Gary. Y’know when Jamie’s on his thing? Going for it like a nutter and saying this recipe is the best thing ever? Well I got caught up in his craziness and decided to make this, the kitchen sink of beef pies. I made a tiny change in substituting stout for red wine (can’t abide beer / lager etc in pies – beer batter on fish is just vile) but other than that it’s the same. 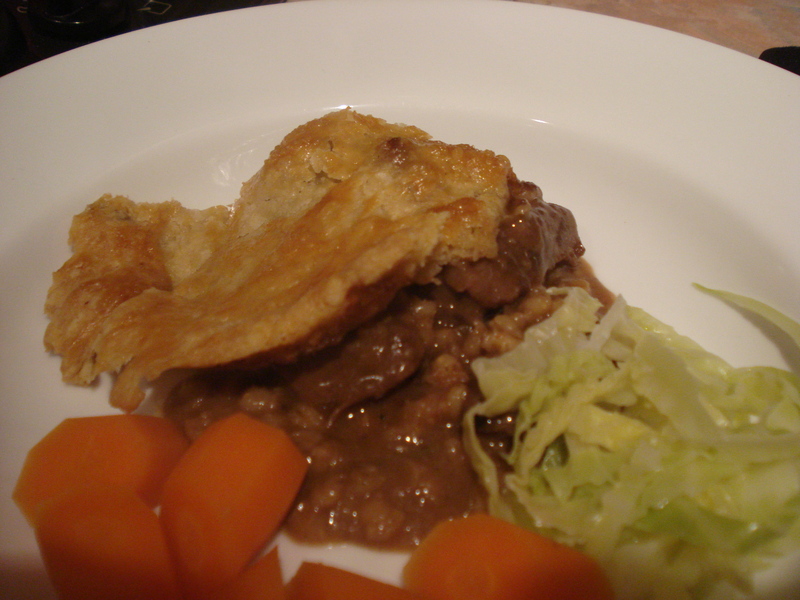 This recipe from Jamie’s Great Britain is just OK – yes, a decent beef stew with a pastry lid but no more than that. I was quite disappointed all told, I was expecting fireworks but ended up with a perfectly OK pie. Good, but not worth making again. PS. A big shout out to Farmer’s Choice for their excellent casserole beef though – meltingly tender and full of flavour. Put a large casserole pan over a high heat and add some olive oil. Toss in the herbs, onions and meat with a little seasoning. Mix well and cook for 10 minutes. Add the tomato puree, wine, flour and stock and bring to a simmer. Turn the heat down low, stuff the lid on and cook for an hour. Then add the pearl barley and leave for another hour. Remove the lid and simmer for another 30 minutes. Add the mustard, Worcestershire sauce and cheese and check the seasoning. Leave to cool while you make the pastry. Rub the flour, suet and butter together until it resembles breadcrumbs. Stir in 60ml cold water and bring it together. Wrap in clingfilm and refrigerate for half an hour. Preheat the oven to 180°C. Ladle the stew into a deep pie dish. Roll out the pastry to about 1cm thick and cover the pie dish. Brush over the egg wash and bake for about 45 minutes, or until the pastry is golden. This entry was posted in bay, beef, food, pearl barley, pie, rosemary, stock and tagged jamie oliver on November 1, 2011 by Gary. Heston Blumenthal has recently created a range of ice creams for Waitrose, including chocolate and rosemary ice cream. I got the chance to try this, along with popcorn ice cream at Waitrose’s Summer party held at the V&A. I was mesmerised by the taste, deeply rich and chocolatey, but with a smooth herbal note. It’s reminiscent of choc-mint ice cream as it provides a similar mentholesque flavour, but remains distinctly rosemary-y. At the event I also realised a big dream of mine – to meet Heston. OK, we didn’t swap phone numbers or make plans to go see Pirates 4. But I did manage to tell him what an inspiration he is to me and how much I enjoy his work. He seemed genuinely appreciative, not merely saying thanks and walking off but keen to express his gratitude. Gushing aside, I had to try and recreate that ice cream flavour that I’d sampled. I was looking to marry that rich smoothness with a warm herb flavour. After some experimenting I’m confident that I’ve nailed it. It’s chocolatey, creamy and really interesting. It would be a good one to wheel out when friends are over for dinner as all the prep is well beforehand and you only need a little to satisfy. It’s really nice with crushed pistachios. A quick tip – this needs a good twenty minutes defrosting to get smooth and easily scooped, so remove it from the freezer just as you serve the main meal. Be warned: bring your whisking arm with you. You can probably make this with an ice cream maker but I’ve never owned one so I can’t help you there. A lot of people go for the ‘ break it up with a fork several times during freezing’ but it’s never made any noticeable improvement to me, so I don’t bother. Put the milk into a saucepan and pop over a medium heat. Roll up the rosemary but leave it intact (this friction breaks the surface of the herb and causes it to leak more oil). Whisk the cocoa into the milk as it heats, and keep whisking until the milk just reaches the boil. Take off the heat. Melt the chocolate. You can use a bain marie for this if you like but personally I find it less faff to use a microwave on low power. Zap it for 2 minutes at a time until smooth. Whisk the egg yolks and 100g sugar together until a pale ivory colour and thick. Add the hot milk to the yolks gradually, whisking all the time. Return the mixture back to the saucepan and put back on a gentle heat. Keep on whisking and add the melted chocolate, and whisk for a further 5 minutes until thickened. Again turn off the heat and leave to one side while you make a caramel. Melt the 6 tablespoons sugar with 2 tablespoons water over a medium heat. Swirl the saucepan round to combine but do not stir. Keep it going until it turns a lovely amber colour, then add the double cream and keep on swirling. When the caramel is smooth add to the chocolate milk, again with the whisking. Pour through a sieve into a freezable container and freeze at least overnight before serving. This entry was posted in chocolate, cocoa, cream, egg, ice cream, rosemary and tagged heston blumenthal on June 8, 2011 by Gary. It’s probably the worst translation in the world, but Google tells me the title of that dish is the Italian for Toad in the Hole. Which is kinda what this is. I was cleaning out the cupboards / freezer and had enough for stodgy, creamy polenta with pockets of herby sausage. This is really good fun served with a punchy tomato sauce. Halve the sausages and squeeze out the meat into little balls. Fry in a hot pan with a little oil and the fennel seeds until the sausageballs are browned on all sides. Meanwhile, do the sauce: fry the garlic gently in a dribble of olive oil for a minute and add the tomatoes and half the rosemary. Simmer gently. Get the grill on hot. When the sausage is nearly done get the stock on to boil. Add the polenta and remaining rosemary, whisking all the time to avoid clumping. When it starts to thicken whisk for another minute and then take off the heat. Add the creme fraiche, parmesan and check for seasoning. You want it to be fairly sloppy so add a little more boiling water or milk to thin it down if needed. Pour the polenta around the sausages and pop under the grill. Check the seasoning of the tomato sauce and add vinegar for twang. When the polenta is bubbling and brown on top get it out and leave to stand for a minute, then serve with tomato sauce on the side. 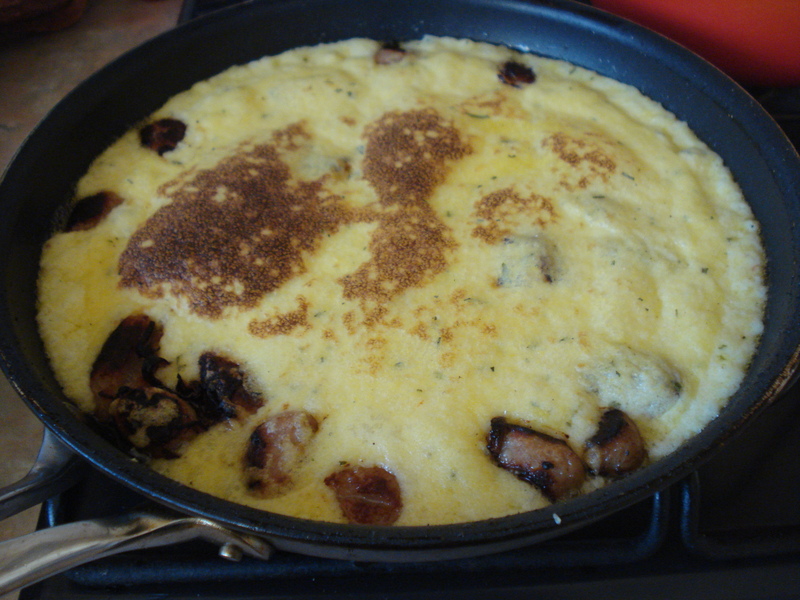 This entry was posted in polenta, rosemary, sausages on May 21, 2011 by Gary.